Excerpt: Ireland in the period covered by this volume experienced Christianisation, invasion, foreign settlement, economic growth and contraction, the development of administrative and political institutions, educational and intellectual advance, prolonged periods of warfare that were often related to contested notions of national and ethnic identity, and religious upheaval and fracturing. To observe that in this its history mirrored that of much of the rest of Western Europe in the same era is to state the obvious, but at least prompts consideration of how Ireland has featured in the historiography of medieval Europe. Excerpt: What were the emotional consequences of the Christianization of Europe? In Medieval Sensibilities, Damien Boquet and Piroska Nagy bring to the English-speaking audience the fruits of their long reflection on this question. They show how, far from being a stagnant ‘Middle Age’ standing between the learned ancient world and the discontented modernity, the period was in constant affective ferment. Social and economic changes in themselves brought new sensibilities and needs. These new milieus, drawing on and filtering, but also adding to, the many intellectual traditions increasingly available to an expanding clerical elite, transformed their thoughts about Christ’s Passion. In turn, these new understandings, taught in the schools, proclaimed in the churches, preached on the streets, and acted out by rulers, transformed the feelings and behaviours of Europeans in general. 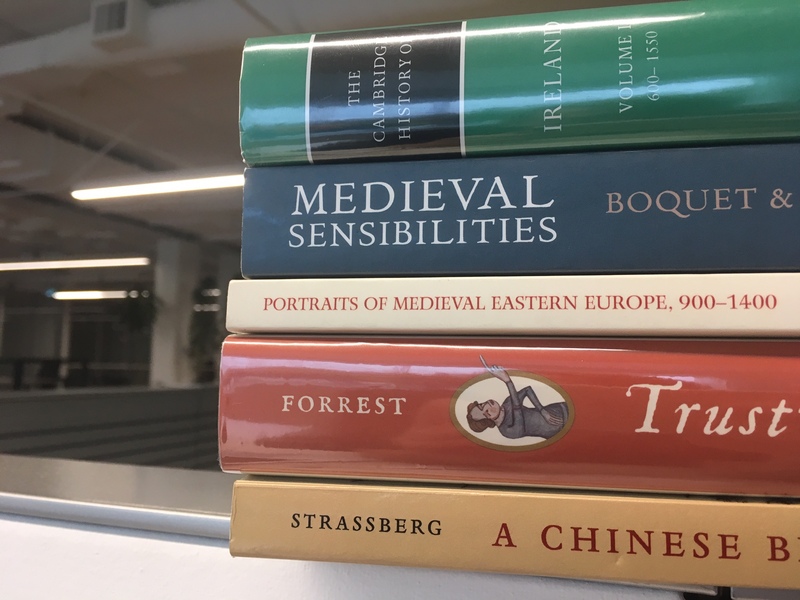 Publisher’s Overview: Portraits of Medieval Eastern Europe provides imagined biographies of twenty different figures from all walks of life living in Eastern Europe from 900 to 1400. Moving beyond the usual boundaries of speculative history, the book presents innovative and creative interpretations of the people, places, and events of medieval Eastern Europe and provides an insight into medieval life from Scandinavia to Byzantium. Each chapter explores a different figure and together they present snapshots of life across a wide range of different social backgrounds. Among the figures are both imagined and historical characters, including the Byzantine Princess Anna Porphyrogenita, a Jewish traveller, a slave, the Mongol general Sübodei, a woman from Novgorod, and a Rus’ pilgrim. A range of different narrative styles are also used throughout the book, from omniscient third-person narrators to diary entries, letters, and travel accounts. Excerpt: There will be two distinct, and yet closely connected, strands to my investigation. First, to take a cue from the keyword itself, the fidedigni: trustworthy people or people worthy of faith. What was the faith, the fides, of which they were worthy? What relation did it have to the faith that all Christians were supposed to have in God? What did it owe to legal conceptions of good faith, or feudal ideas about fidelity? How was it connected with the confidence essential to everyday life?